It’s easy to schedule your pet’s Home Pet Vet appointment. Choose the date and time for your appointment online, and we will visit your home at your convenience. 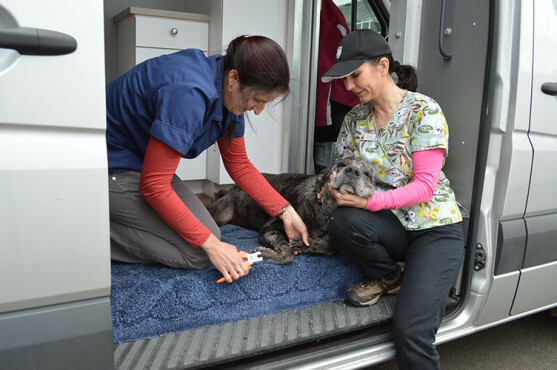 Your pet will appreciate the comfort of its own environment — whether you choose our Mobile Exam Room or inside your home. Serving Southern Oregon, Home Pet Vet provides professional and compassionate veterinary care for your dog, cat, or “pocket pet” in the comfort and convenience of your home. 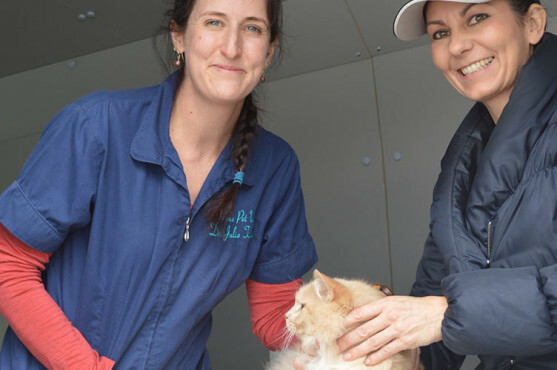 Our on-site services by Dr. Julie Tavares and her vet assistant include professional veterinary care in a state-of-the-art mobile veterinary exam room that is custom-built to expertly handle an extensive set of pet needs in a stress-free environment. By choosing Home Pet Vet to come to your home, you can avoid the trauma and potential harmful environment of a traditional veterinary clinic. A pet house call also provides convenience when you have multiple pets, are busy, or have mobility issues, allowing you to avoid the time involved with travel and busy waiting rooms with other varieties of animals. Your pet house call is a personalized experience with Dr. Tavares’ full attention. We come to your home or location throughout Southern Oregon and the Rogue Valley (including work locations) and provide complete pet diagnostics and treatment, as well as provide any pet products, vaccinations, and additional veterinary services you may need. We treat all breeds and types of dogs and cats, as well as birds, hamsters, gerbils, mice, rats, guinea pigs, rabbits, and other small household pets. Familiarity. Pets often experience fear and trauma when taken from the security of their home to a veterinary hospital. In addition, pets are typically “not themselves” in an unfamiliar or uncomfortable setting, making it difficult for veterinarians to evaluate pet behavior during examinations for lameness and behavioral counseling. Home Pet Vet makes it possible for your dog, cat, or small animal to be in their own environment where they are more comfortable and relaxed. Safety. By keeping your pet at home, your pet can avoid being exposed to stresses that may be present in a veterinary waiting room. Young and old pets are especially susceptible with weakened immune systems. You can also avoid encountering larger or more aggressive animals. Convenience. We come to you on your schedule. There are no waiting rooms, driving time or travel stress for anxious pets to endure. Home Pet Vet also offers personalized attention and greater flexibility in scheduling. 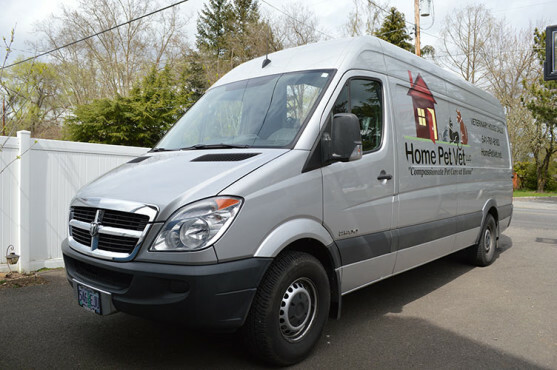 Our service area includes the Southern Oregon communities of Medford, Ashland, Grants Pass, Rogue River, Gold Hill, White City, Eagle Point, Central Point, Phoenix, Talent, Applegate, Jacksonville and Ruch. State-of-the-Art Mobile Exam Room. 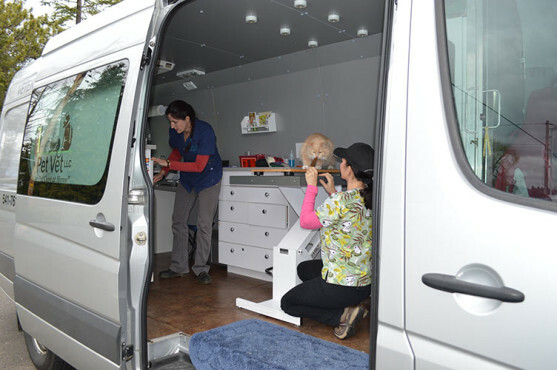 Dr. Tavares’ van, known as the “Mothership,” is an innovative mobile exam room capable of handling most veterinary needs. It provides a clean, comfortable and efficient atmosphere for your pet. Our mission is to make a positive impact in the lives of pets and people through compassionate, convenient and personal service in a home setting, while upholding the highest standards of veterinary medicine. Serving the Southern Oregon communities of Medford, Ashland, Grants Pass, Rogue River, Gold Hill, White City, Eagle Point, Central Point, Phoenix, Talent, Applegate, Jacksonville and Ruch. Home Pet Vet LLC © 2019 | All Rights Reserved - Website Made with Moxie!